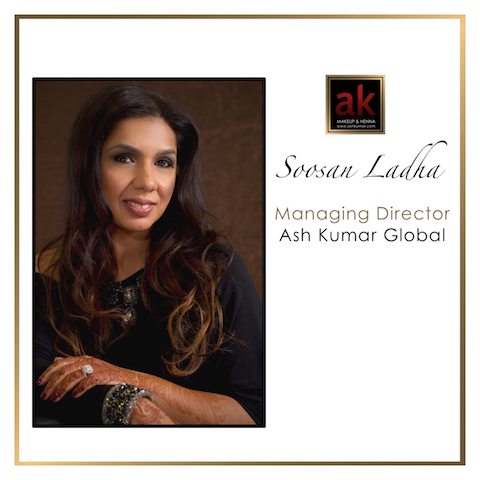 Soosan Ladha has been with the Ash Kumar Group of Companies since 2010. While Soo's academic background is in Education, she had the opportunity to be trained at the Ash Kumar Studios in London to pursue her interest in Henna. Mr. Ash Kumar was impressed by Soo's passion and ambition, and within just a few short weeks of returning to the USA, she was offered a key position as Training Course Advisor for North America. She shares Mr. Kumar's vision in expanding the already established global AK platform for aspiring artists, empowering them with the reach, tools, materials and drive to succeed in the world of beauty. Driving his core belief that every single person who touches the Brand, should have an “Ash Kumar Experience.” Ash Kumar-the brand, have set the standard for other Asian Beauty Companies Globally to follow suit, by surpassing expectations and bringing the wider beauty community together. Soosan has achieved many accomplishments as a businesswoman within the AK Brand sector, and is fast becoming a role model for many aspiring Asian Women in business. What drives her is the belief that woman can have it all. She believes that you can be a mom, a wife, a friend, a sister and a career woman without sacrificing one for the other. “The secret to success......Work harder than you are working right now”.